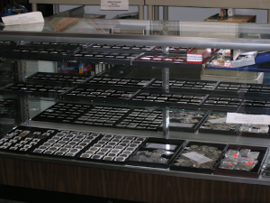 All C's Coins & Collectibles has one of the largest selection of coins in Colorado, and we are always looking for new items, whether old coins, foreign coins, gold coins or silver coins. As a PCGS (Professional Coin Grading Service) and NGC (Numismatic Guaranty Corporation) authorized dealer, you can depend on us to give you a fair assessment of your items. And we pay top dollar! Call us today at (720) 773-6848 to find out what your coins are worth!